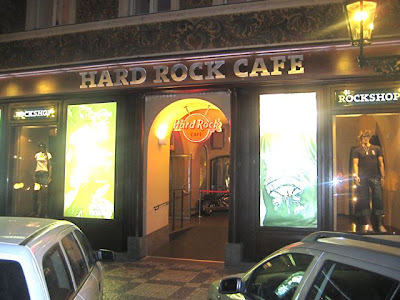 Perhaps it will hurt my expat street cred, but I confess my interest was immediately tweaked when I heard a Hard Rock Cafe was opening in Prague. After all, I am an American guitar player with a penchant for good hamburgers. I fall into a very specific demographic niche. 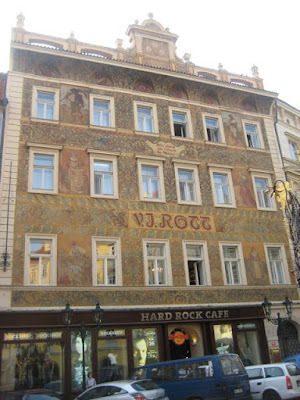 Just days after Prague's Hard Rock started doing business, I went to the restaurant on Malé náměstí, just off Old Town Square. 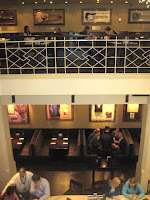 They converted the old V.J.Rott building, with its neo-Renaissance façade, into the familiar, music-themed restaurant. 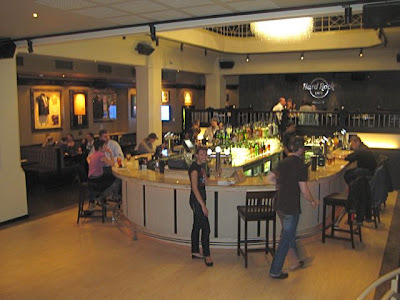 Within the establishment's 1900 square meters are three levels and two bars. 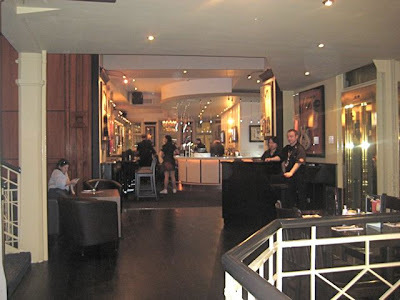 The platform behind the downstairs bar can be turned into a stage for live acts. 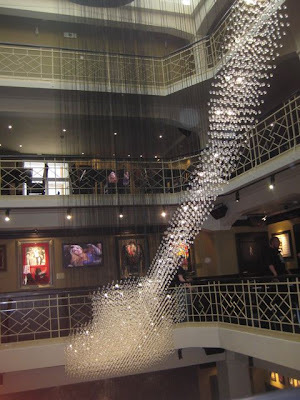 This location is considered the largest Hard Rock Cafe in Europe. 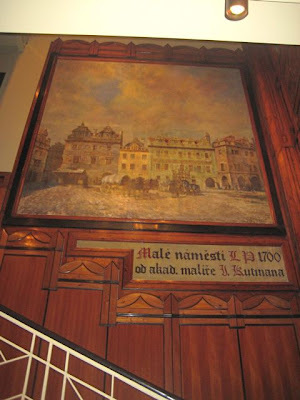 When I arrived, I was directed up the stairs, past old wood paneling and a painting from the building's past life. V was not interested in joining me, so I was dining solo. Sometimes, when you eat by yourself, you get the feeling you aren't a valued customer. Unfortunately, this was one of those times. The place was barely half full, and they directed me to one of the worst tables in the house. It was next to the swinging doors of the kitchen. So, I can report they have white-tiled walls in there. This area also turned out to be a rather hectic meeting spot for the many servers. 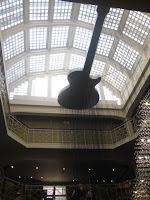 In the opposite direction, the table did have a good view of the five meter-long guitar-shaped chandelier and the bar on the floor below. "Are you eating alone?" the smiling waitress asked. "Awww." She made a sad face. "Really?" "Just me. You can join me if you want," I said. So, she did. Cute. We talked for a minute about where I was from and whether I was enjoying Prague. "So far, it's been pretty good," I said. Her name was Tereza, and I was her first customer. She was very nice and not in a scripted, corporate way. Refreshing. It's understandable she thought I was a visitor. After a good look at the prices, I realized tourists are probably the target customer rather than long-term expats. I'd also note that I couldn't find a Czech language version of the restaurant's website. Our enjoyable tête-à-tête concluded after I ordered a bacon cheeseburger (280 CZK) and a chocolate shake (120 CZK). Now, I've studied the burgers all over Prague. This one was excellent. I'd call it the second best in the city (I'll tell you my favorite in a moment). The top-quality meat was flame-grilled. This is key in my book. 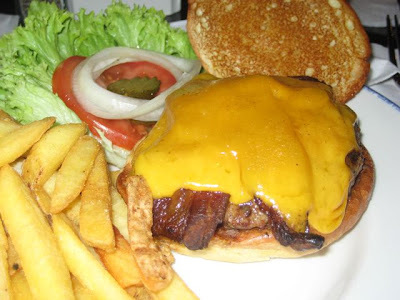 There was American-style bacon and cheese, plus lettuce, tomato, pickles and onion. The bun was perfectly toasted. The fries came with a little skin on them. But they were just barely warm. For the record, I'd say the best bacon cheeseburger in Prague is at Bohemia Bagel in Holešovice. It is very large, flame-grilled, with more bacon and a slightly better bun. It edges out the win for my affections even before you add the fact that it is only 155 CZK, fries included. 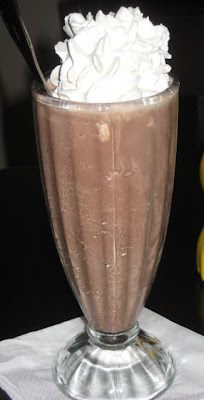 The Hard Rock's chocolate shake, topped with whipped cream, was extremely thick. The generous amount of chocolate ice cream was nice, but it wasn't mixed well. It was too thick to drink. You can quote me on this: I sucked really hard. The flimsy straw failed to maintain structural integrity and collapsed. I had to wait a while for the ice cream to melt before I could partake. Over the loud music, Tereza told me that ice water was free. 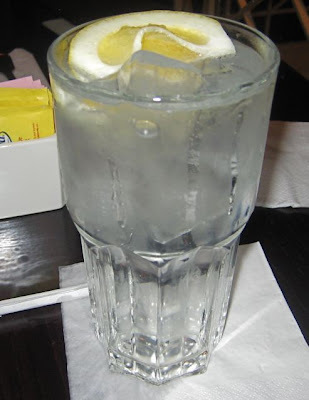 I like the bubbly stuff, so I ordered soda water, thinking for some reason that would be free, too. My mistake, but it cost 60 CZK. That's more than a half-liter of Staropramen, which is only 50 CZK. So, the bill for this trip was 460 CZK. It was a good, classic American meal, with a fun and fast waitress. I was quite full. But I considered it a steep price to pay for a burger, shake, fries, and water. My curiosity levels about other offerings was still high, so I went back the next night. By myself. And they tried to give me the exact same table again. Which I refused. It felt like that scene from "Animal House," where the rich fraternity boys repeatedly direct the two misfit pledges, the hapless Larry Kroger and Kent Dorfman, to the room for social outcasts. 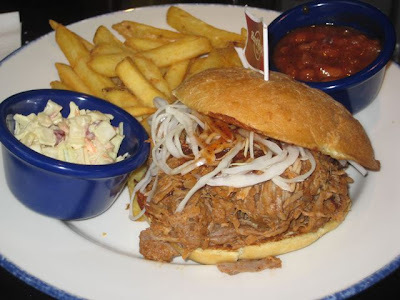 On this second visit, I ordered their famous Hickory-smoked Pulled Pork Sandwich (250 CZK). It came with fries, baked beans, and coleslaw. I had a pretty young-looking guy as a waiter this time. He told me the pulled pork came with a choice of barbecue or a vinegar sauce. The latter sounded more unusual and intriguing. I asked for that. When I took the first bite, two things happened. First, half the pork fell out of the bun onto the plate. It was a huge amount of meat. Plan on using a knife and fork at some point. Second, the super sour vinegar and slaw hit the back of my throat, and I had to stifle a serious cough. Man, that was strong stuff. I made sure there was much less of it in each bite. The pork itself was shredded and tender. I love smoked meat, but I couldn't detect much in the way of smoke flavor. The beans were quite sweet. I ended up pouring them on top of the pork. Maybe I'd have been happier with the barbecue sauce. The fries were properly cooked and delivered much hotter than those on the first visit. The little ramekin of coleslaw was nothing special. The Hard Rock Cafe has a cocktail menu with lots of pretty pictures. I decided to try a couple. 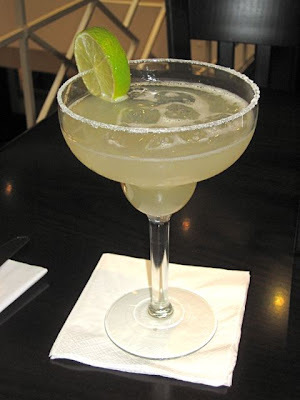 First, I had a Golden Rita, AKA a margarita (180 CZK). It was made with Jose Cuervo Gold Tequila, Triple Sec, and Hard Rock Margarita mix. It came in a classic margarita glass and was strong. However, for the money, I was expecting something a little more... impressive. I wished the glass was filled a little higher. I prefer my margaritas on the sour side. This one was too bland for my taste, even after I squeezed in all the juice from a thick lime slice. I suppose it could appeal to more middle of the road tastes. I asked the waiter for extra ice. It never came. In fact, he disappeared for a long time. When I wanted a second cocktail, a waitress noticed my forlorn look and took my order. 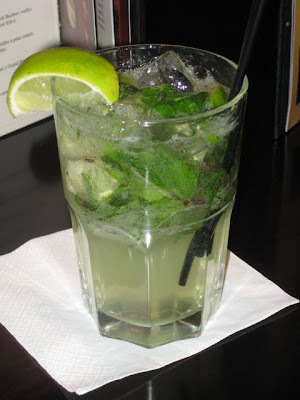 I went for the Mojito (130 CZK). Bartenders tell me this is the most popular cocktail in Prague, by far. And I've had more than my share for comparison. I thought this one was just bad. It was intensely sweet, almost syrup-like. I usually find mojitos refreshing, but this candy-like cocktail really dragged me down. I'd urge them to change their recipe. Suffice it to say, I was in no mood for dessert. The bill for this second visit totaled 560 CZK. The majority of the tab was for the two drinks. I felt I had to return one more time. There was one more thing I wanted to try. I went for an early lunch right after they opened at 11:30 AM. This time, the greeter asked me if I'd like to sit at the downstairs bar. I said no, so he then told me to pick any table I wanted. I had a very earnest and friendly waiter named Kevin from Sweden. Then, I saw my old friend, Tereza, and we had a good chat about life in the restaurant business. Since there were few other customers, they both kept me company and made sure I had everything I needed. 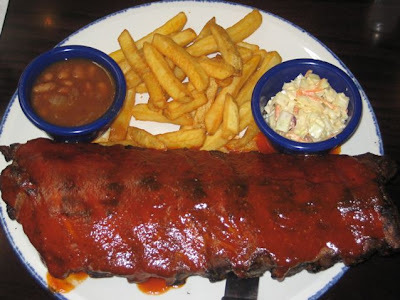 I ordered the Hickory-Smoked Bar-B-Que Ribs (390 CZK). They came with fries, baked beans, and coleslaw. The rack had a number of positives going for it. The meat had some char to it along with the smoky flavor I'd been looking for. It was also quite lean. I liked their sauce. It was not too sweet and had a nice tang. However, there is a downside to lean ribs. They were not as tender as I expected. The menu says the meat falls off the bone, but I had to use a knife and pull pretty hard to get them apart. I also thought they should have been hotter. Like many restaurant ribs, these had to be cooked mostly in advance. That's how they can come out 10 minutes after you put in your order. It was a lot to eat and the ribs lost a lot of their warmth by the end of the meal. Now, there is a strain of thought that restaurants shouldn't be reviewed until they've been opened a while. But I reject that. I know the realities of new operations, but my feeling is that I'm paying the same prices that people will pay six months from now. They should be firing on all cylinders from the start. 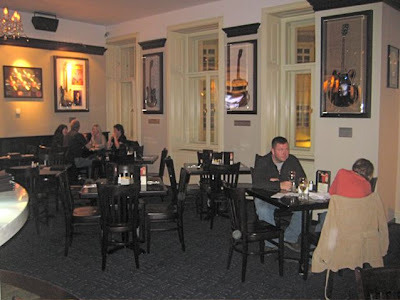 In the end, I concluded I did not really belong in the Hard Rock Cafe's target demographic. On my way out, I browsed past the restaurant's guitar collection. Instruments used by REO Speedwagon, Seether, and Asia didn't do too much for me. But I must admit I was awed by what is probably the most prized item. 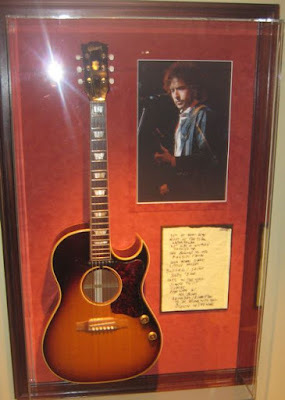 On the stairway was Bob Dylan's well-worn Gibson acoustic/electric guitar, along with a hand-written set list written by the man himself. I stared into the display case and, for a long moment, I forgot about my problems with issues like the prices, the mojito, and the waiter who forgot about me. It's amazing what a good guitar can do. tip regarding 'heavy' mojitos: i've found that topping the drink off with sparkling (or soda) water corrects it fairly well. cheers.